Highly concentrated mild yet powerful detergent degreaser Suitable for a wide range of cleaning applications, from cleaning oil and grease from industrial floors, cleaning vinyl, and cleaning carpets, to general hard surface cleaning. Can be applied by cloth, sponge, brush, mop, hand trigger spray or even steam cleaner. 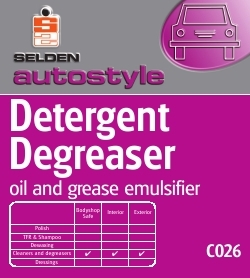 Solvent free - will not attack bitumen so Detergent Degreaser is safe to use as an oil and grease remover from asphalt surfaces. Ideal for use with steam or high pressure cleaners or mechanical floor scrubbers. For oil and derv removal dilute 1 part product to 20 parts hot water. For general cleaning use 1 part product to 100 parts water. Detergent Degreaser will work with either cold, warm or hot water, consistent with most detergents its performance will be enhanced in warm or hot water when compared with cold. Composition A blend of nonionic emulsifiers and solubilising agents with chelating agents.